The Master Lock No. 4401EURDLH Smart Padlock features a 56mm wide metal body for durability. The 9mm diameter shackle offers 51mm vertical clearance and is made of boron alloy, offering maximum resistance to cutting and sawing. The Smartphone/app interface offers speed, ease of use, & greater control with the ability to share access, with keyless convenience. The locking mechanism features anti-shim technology, offering maximum security. The Limited 2 Year Warranty provides peace of mind from a brand you can trust. Use your smartphone to open your lock with the free Master Lock® Vault eLocks app. Never worry about a forgotten combination! Share access with others - temporary or permanent. Share 24/7 access or limit to days or nights. Monitor access history & receive tamper alerts. Backup access using directional code on lock keypad. 2-piece weather cover for maximum outdoor protection. Low battery notification & reminder on padlock and in app. Comes with easy to replace CR2 battery. Battery jump allows for temporary access if battery dies while locked. Use the app to view padlock use statistics such as who had access, when and for how long. Dual rolled pin locking mechanism / Pry resistant body. Weatherproof, suitable for external use. Boron carbide shackle for better resistance to bolt cutter. 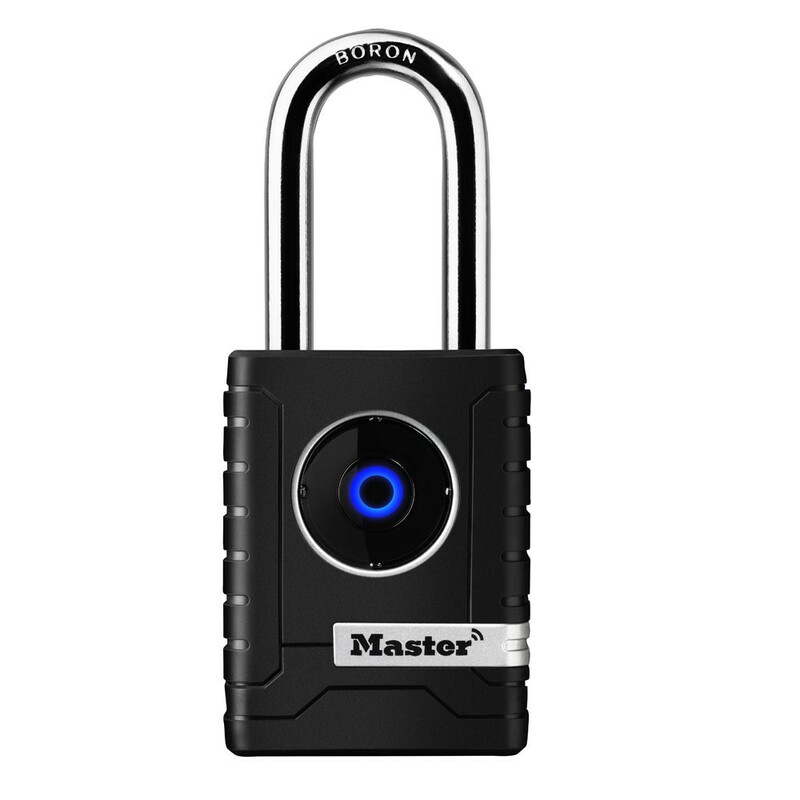 Unlock the padlock without key or combination using the Bluetooth® Smart protocol in a smart phone or device. Share access remotely via the free Master Lock Vault app for Android and iOS, access can be granted for limited time frames.